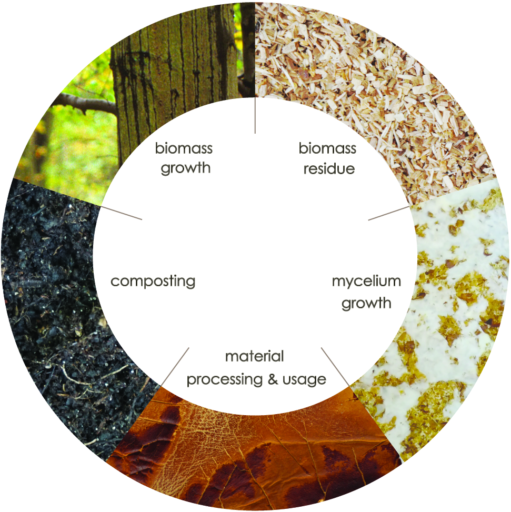 The mycelium grows on residual biomass, such as sawdust or agricultural residues, with supplemented nutrients. A network of fungal threads (mycelium) branch and fuse together to create a strong material. This growth process is controlled by adjusting the environmental conditions, so that we obtain the desired material qualities. Through pressing, drying and coating with biodegradable and harmless chemicals, the material mylium is made ready for implementation in products. After usage it can be transformed into compost and serve as nutrition for new plants and trees. Mylium uses waste as a resource and leaves no waste behind! What applications are suitable for mylium? Mylium is a bendable and strong material with a soft skin-like touch. For this reason it’s a suitable material for products that come in contact with skin, such as accessories, bags or shoes. However the potential of mylium extends further than fashion industry. The material is appealing on the outside, but its elastic properties could also (partly) take over the function of foam in furniture. And its light in weight! Perhaps we could reduce fuel consumption in transportation if we implement mylium as seat upholstery? Won’t the mycelium grow further during usage? This won’t happen. After the drying step the mycelium is no longer alive. Since mylium is biodegradable, won’t it fall apart in the rain? It’s often misunderstood that biodegradable and compostable materials need specific conditions to facilitate the degradation process. There is more needed than just the pressence of water for mylium to fall apart. It needs specific conditions with controlled humidity, temperature and the presence of soil micro-organisms. Naturally, mylium is not water resistant. However, when mylium becomes available on the market it will be treated with a biodegradable and harmless coating that makes it water resistant.